How is my tiny baby already 2 months old? The past 9 weeks have come and gone so fast. I cannot believe how time is flying by. It has been the best 2 months of my entire life. This little girl has not only brought so much joy to so many lives, but she has brought JP and I even closer together and made both of us better people. I thank God every day for allowing us to be her parents! 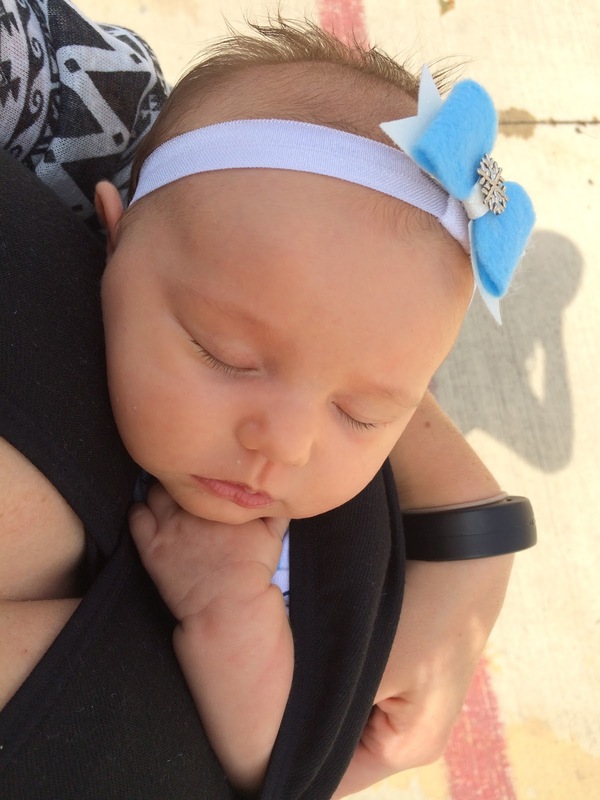 Yesterday, we went into the doctor for the dreaded 2 month shots. I’ll admit, It wasn’t that bad at all. I didn’t think that I would cry, but I was still nervous. Chloe took her shots like a champ. In fact, she didn’t even cry until the second shot! The third one kind of did her in though. She was hollering after that one, but luckily it was the last one and I just fed her immediately. 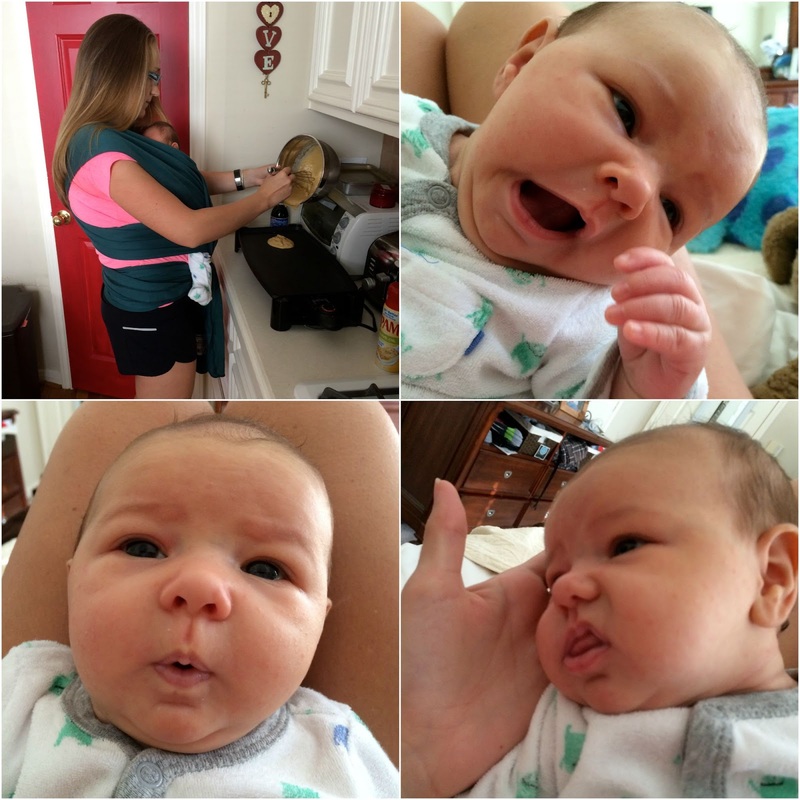 This little chunk loves to eat, so it soothed her as soon as she latched. I’m so proud of my girl! And mom and dad didn’t shed a tear. The rest of the day she was just sleepy, so we snuggled in our jams, read books and relaxed. Chloe is growing so fast! She now weighs 11lb 7oz (52%), is 22 5/8 inches long (57%) and her head circumference is 15 1/2 inches (82%). 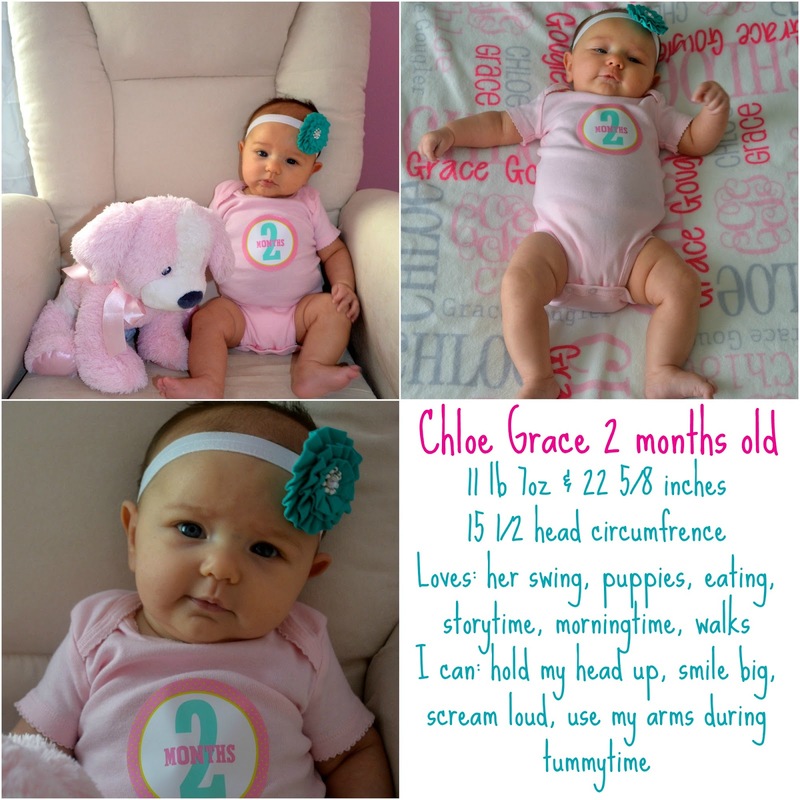 She is right on track with the majority of 2 month old girls with her head slightly above average…still. She has her daddy’s noggin that’s for sure! 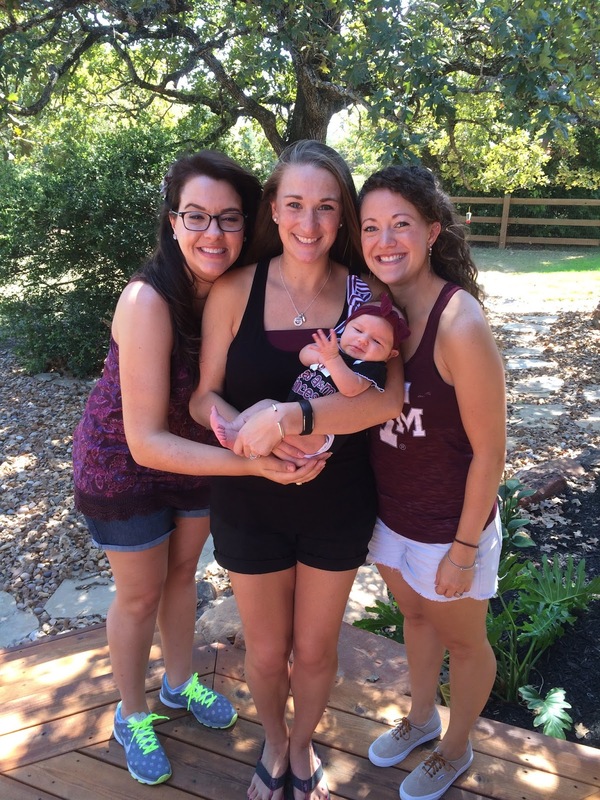 This month Chloe watched her first Aggie football game, went to her first tailgate, met a lot of her mommy & daddy’s friends from college, took her first trip up to Dallas and spent lots of time with all of her grandparents! She is so much more expressive and brings life to every room. I love seeing her smile when I talk to her or when I’m reading her stories. 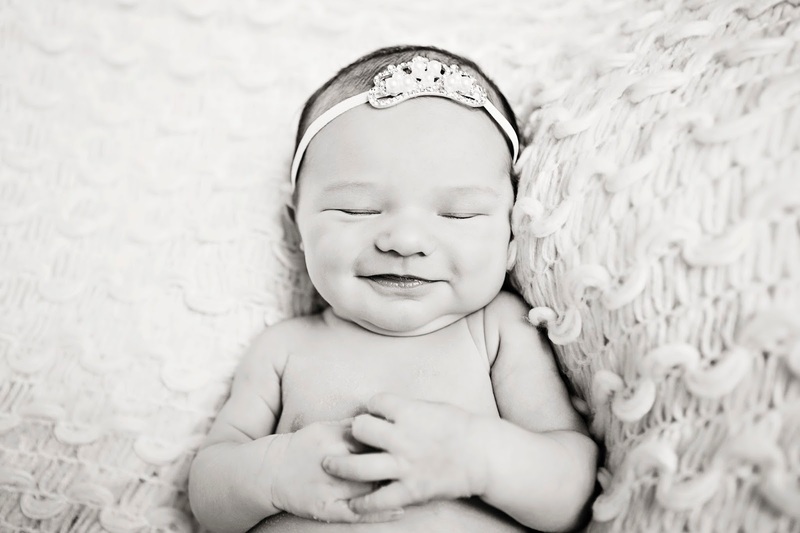 Morning time is our favorite time of the day because she is smiley and easy going. Some days I wish we could just sit in bed all day making funny faces, talking and hanging out. She is a complete wiggle worm and is living up to the name we gave her in the hospital: ChloWorm. It was originally because she looked like a Glow Worm all swaddled up. Now it’s because her arms and legs don’t stop moving. She’s like her mom and thinks that sitting still for too long is hard! 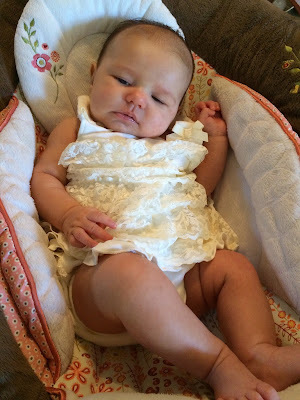 She loves to sit up right facing away from you so that she can see what’s going on and she loves to stand up! She does a great job of putting weight on her feet and bouncing around. I just love my movin’ and groovin’ girl! Time is flying by! You are growing so big and strong before our eyes. You love to lift your head and look around at everything around you. Your favorite things to stare at are fans, shadows, mobiles and mirrors. You’re pretty darn beautiful, so I can’t blame you for loving your mirrors! My love for you continues to grow each and every day. I had no idea that my heart could be so full. Your daddy and I love spending evenings together just hanging out on the couch watching you and playing with you. You love your daddy’s funny faces and noises that he does to make you smile. You love your mommy’s voice and laying on my chest. I hope you love these things forever and ever. I know that one day you won’t need us as much, but right now, we love being your whole world. You’re doing much better sleeping at night, but sometimes the struggle is real. You fall asleep around 9-10pm (most nights) and stay asleep until 3-4am! Mommy is so thankful for that nice long stretch. Then you wake up around 6-7am ready to eat and start the day! Since mornings are your favorite, I don’t mind getting up with your beautiful smiling face. I can’t wait to continue watching you grow and develop into a little girl. My tiny newborn is no longer a newborn. You are officially in the infant stage and becoming your own little person. I promise to teach you everything I know and to make sure that you know and love God. You are blessed beyond measure with so much love in your life baby girl! Mommy and Daddy love you beyond words! Here’s to the first two months of your life. Let’s see what the future brings. For as long as I can remember, 28 has been my most favorite number. Kind of strange, I know. There is always a method to my madness though. On September 28th twenty eight years ago, I was born! Birthdays have always been my favorite. Not just my birthday, but everyone’s birthday! I love to celebrate an individual and get them awesome presents. (Though they are often late lately! Thanks mommy brain.) 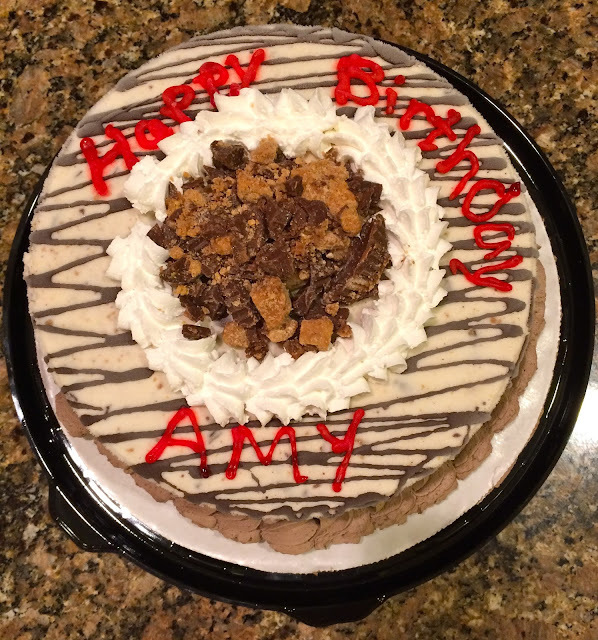 Naturally, as a lover of birthdays, I love my birthday the most. Thus making 28 my favorite number. It also helps that it’s even since I really don’t like odd numbers. I was born in an odd month, during an odd year, but luckily on an even day. Twenty eight. It just has a nice ring to it. Today is my golden birthday. Today I am twenty eight. I received the most amazing gift this year. My angel baby. She’s already making twenty eight even more magical. She was the first person I talked to and hung out with on my birthday during our 3:30am feeding. She really wanted to be the first person to wish me a happy birthday since I was born at 3:42am. Thanks Chloe! She was the first person I saw beside my bed when we finally got up. She was the first person to give me a birthday smile and a birthday hug! She’s a pretty considerate baby if you ask me! It also started out wonderful because my main squeeze went to Whole Foods to get me my favorite iced coffee to start my morning off right! While he was at it, he picked up a pancake and biscuit for me since carbs are my favorite. He also took his 7:30am call from home so he could see us for just a little while before going to work. Yup, twenty eight is going to be great. I just know it. Especially with these two in my life! I gave myself this last week off of work for my birthday. Chloe and I are going to do lots of fun things to make sure it’s the best birth week ever! It’s raining today, so we’ll have rainy day snuggles and tonight my girls are coming over for pizza and Pitch Perfect 2! Later this week, we’ll definitely go to the zoo for the first time, and a walk on the bayou is definitely in store. 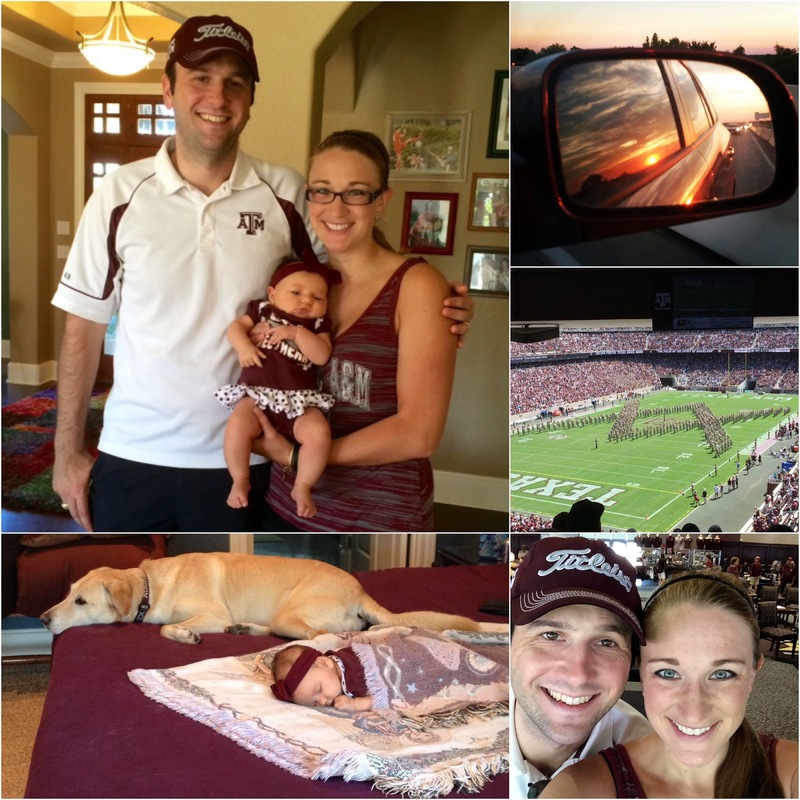 This weekend we were able to celebrate a bit by heading up to Dallas for a quick trip! I got to see my brother(Ben), sister-in-law(Kate) and one of my best friends(Kristin)! We also got to see a bunch of our besties from college to celebrate Hanna Jo’s 30th birthday! 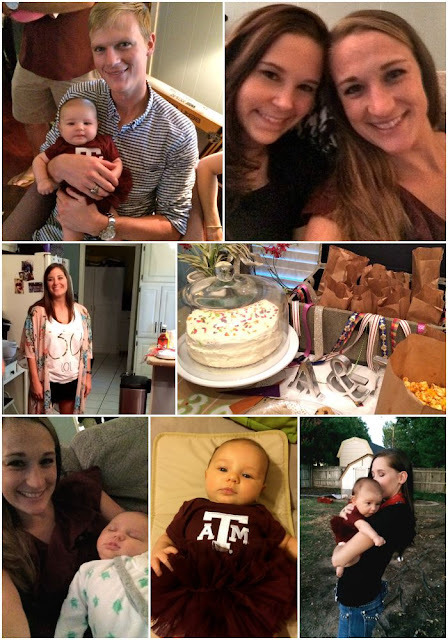 Birthdays are awesome, but 30 is a milestone and I’m so happy that we were able to be there to celebrate with HJ and watch the Fighting Texas Aggies pull through with a victory in overtime against Arkansas. It was a stressful game for the guys. Chloe was not impressed. She looked awesome in her cute Aggie gear, but it was her awesome monster jams that helped the Ags pull off a win. Something about adorable monster footie pajamas on a little girl just makes football teams win. It’s the truth. Now I’m off to do some awesome twenty eight year old type things. You know, like eating pancakes for breakfast, playing on the floor with a baby and some puppies and if I’m lucky, watching Disney movies, Harry Potter and Pitch Perfect all day long. Here’s to twenty eight and another year of just being awesome! Good morning and happy hump day y’all! Monday marked exactly 2 weeks until I go back to work. What?! Are you kidding me? From the first week I took off to the time I return, it will have been gone a total of 10 weeks. 9 of which were spent with my little angel baby! I ended up taking a week to myself before she was born because of some serious back pain that I was dealing with. Back pain, pregnancy and being a personal trainer/group exercise instructor do not go together. That was about the same time I stopped working out. Again, due to the back pain. 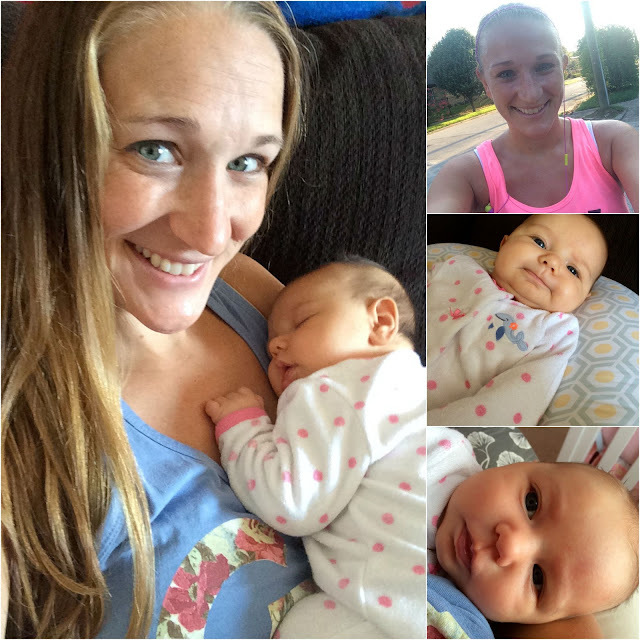 I started working out again about 3 weeks postpartum which meant I took a month off from working out. That was a long, but necessary month for me. I’ve been easing back into working out over the past 5 weeks. The most exciting bit for me was running! I had to stop running back in February when I destroyed my ankle at 16 weeks pregnant. Not being able to run was torture. I hadn’t taken a serious amount of time away from running since 2010. What I didn’t realize is how hard it is to start again once you’ve stopped. It’s even harder since I’m postpartum and my body just isn’t the same as it used to be. It never will be exactly the same and I’m okay with that. I do, however, want to lose the last bit of my baby weight. It’ll make running easier that’s for sure. So in order to get back to my pre-baby runner lower body, I’ve been working on some killer leg and booty workouts to help me tone and strengthen! Here is one that’s awesome for the booty, quads, hamstrings and inner thighs! Here are some links to provide examples of the exercises in case you have no clue what I’m talking about. You can also reach out to me with any questions! Be sure to give this a try on your next lower body day! You’ll be sure to feel the burn after! What are your favorite lower body toning exercises? …visiting family in College Station. …beating the hell outta Nevada! …enjoying the air conditioning in the Zone Club (thanks Rob and Sarah Lee!) when it’s sunny, hot and 95 degrees at the game. 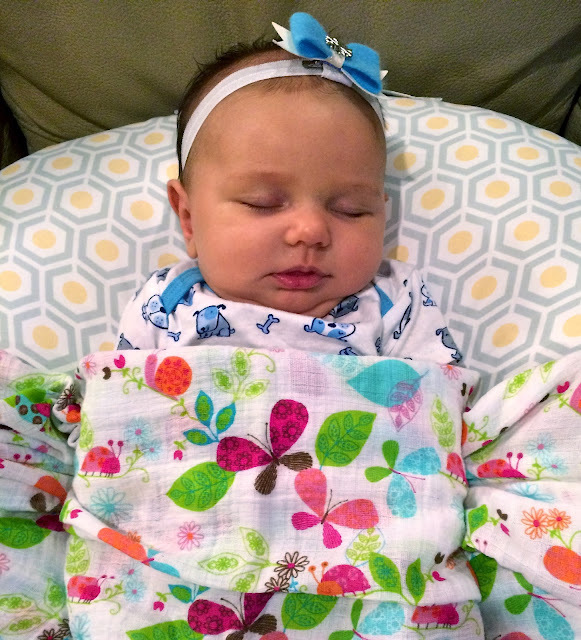 …Chloe snuggles with her JoJo and Paz while mommy and daddy escape to the game for a few hours. …Texas sunset while heading back home. …jams all day! That’s my favorite kind of day. Who doesn’t love PJs? …family time on the couch watching football and relaxing. Weekends are for having fun. Just saying. And this weekend, we had a lot of fun. Now it’s Monday and only 2 more weeks until I’m back at work…yikes! 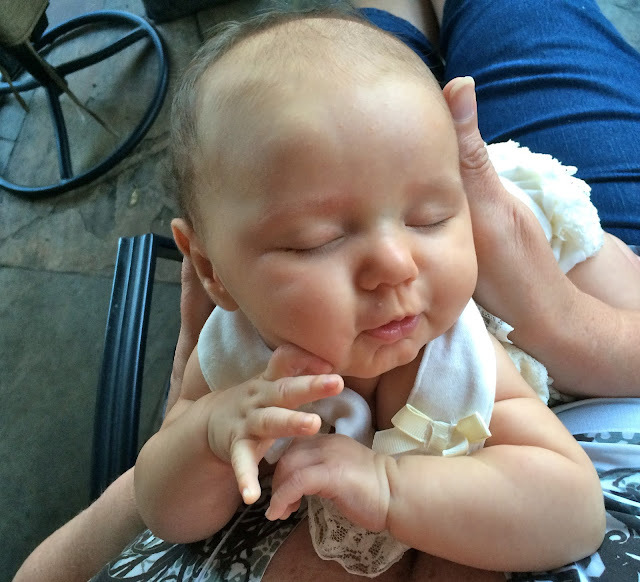 Better soak up every minute with this little baby…who is currently screaming her head off. Time to go! What do you think that weekends are for? My birthday! Duh, number 1 reason right there. It’s at the very start of fall. In fact, just one week in and I love it. Fall clothing. It’s the cutest. Boots, sweaters, skinny jeans, darker colors, all the pretties. Holiday season. The majority of the holiday season is during the fall. Christmas is only a few days into winter, so all the prep and excitement happens in fall. Eventual cooler temps. They do come. It just takes time. Here’s the top thing on my birthday wish list that I already have. It’s my most favorite present of all time. Like ever. 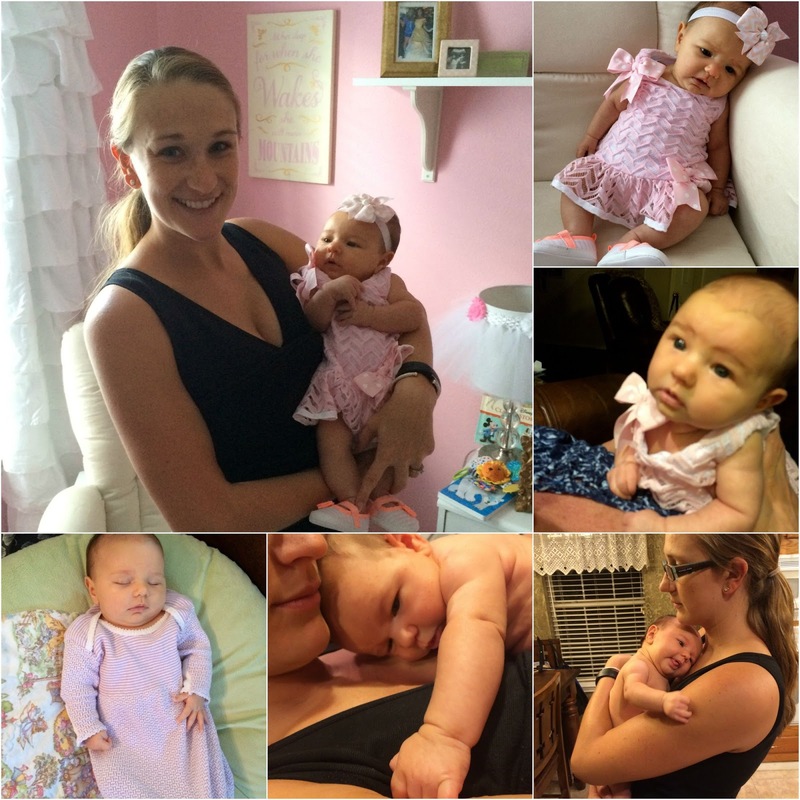 I seriously had no idea that such a tiny little thing could bring so much joy into so many people’s lives! Pretty much anything Kendra would make my heart happy, but these are a few of my faves. I love dangle earrings, but prefer studs. I can wear them to work and around Chloe! She’s not grabbing at dangly earrings yet, but that’s in our near future! I’m going back to work, so work clothes are required! It also helps that my work attire is the same as my running attire which is the same as my stay at home with Chloe attire! I really like the Wunder Under Crop for work and I like the color and style of this fold over crop! Super cute and comfy to wear. 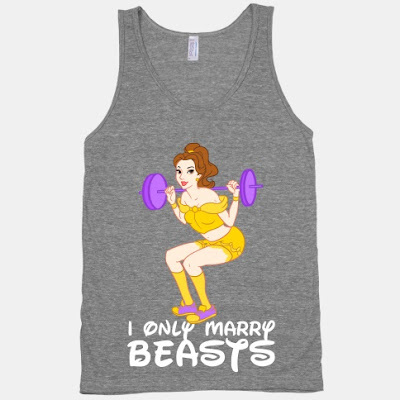 I’m also in dire need of a heavy duty sports bra for running and HIIT training. My girls are much larger than I’m used to and they need some support! Because you can never have enough awesome shorts and witty tops! I need new running shoes! I’ve been reviewing Mizuno Wave Rider running shoes for the past few years and usually, their new shoes come out just as I need new ones. Well, since I haven’t been blogging as much or doing product reviews as often, I haven’t been able to do Mizuno reviews. Plus, they haven’t come out with their new Wave Riders. I’m not sure when they will, so I need new Mizunos! I’m thinking about trying out the Wave Sayonara 2 because I loved the original Sayonaras when I was able to review them a few summers ago! If I don’t love them, then I’ll get another pair of the Wave Rider 18s. Crossing my fingers that the 19s will come out soon and I can give them a test ride! A girl can never have too many Disney movies. Especially when raising her mini-me the right way! I have several on DVD already and now I’m really trying to make sure I have all of the necessities. My old Garmin watch is well, old. My old Polar Loop, also old. This baby puts the two together and makes for one happy Amy. I blogged about my favorite fitness gadgets last week and it made me REALLY want this bad boy. Football season is here. You can never have too many cute clothes to support your team. Plus, maroon is an awesome fall color! I have tons of cute Aggie dresses, but not as many tops as I would like. 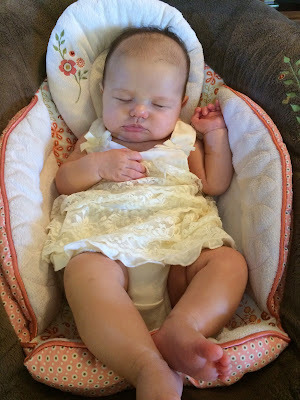 Since I’m breastfeeding, dresses are a bit more awkward because you can’t just pull your dress up. You could, but that would be a little weird. So there you have it, just a few things on my birthday wish list. Nothing completely mandatory for me to have for my life to go on, but since people were asking, I thought I’d share. Now go off and have a fabulous Friday. Because you deserve it! We didn’t tailgate in Spence Park on campus. I didn’t actually go to the game. We have an extra addition to the family! 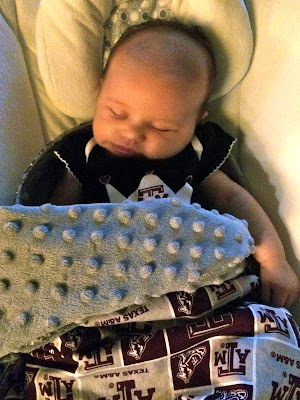 Yup, Chloe’s first game day weekending in Aggieland! It started with our traditional Friday afternoon trek up 290, pitstop at Buc-ee’s and then up Highway 6 to College Station! I love wearing my Lalabu Soothe shirt when we go on road trips, so I can just stick Chloe in the pouch and wear her around our pitstops. It’s way easier then carrying around her carseat or putting on my Moby Wrap or Baby Bjorn for a quick stop. Friday night in College Station, we were reunited with my wonderful in-laws and some of their friends! We had a delicious dinner and lots of good conversation before I left Miss Chloe with her daddy and JoJo. I definitely needed some shuteye, so off to bed I went! Saturday morning I woke up and was determined to go for a quick run because it was so beautiful outside! It takes me a bit longer to get going these days. I have to get out of bed and get myself ready, feed and change Chloe and pee about 10 times before I’m ready to run! I was able to squeeze in 2.25 miles before I needed to shower and eat in preparation for game day. Well, really I needed to do that so I could go shopping. 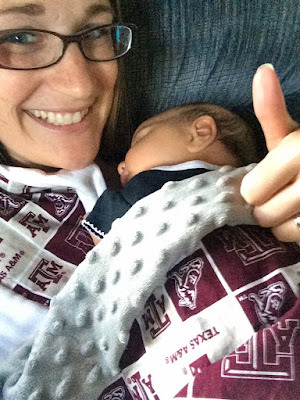 The Warehouse has awesome Aggie gear for great prices and Chloe and I needed more stuff. 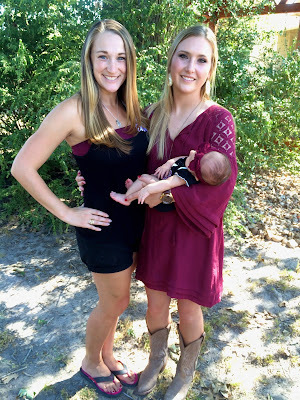 There is NO such thing as too many Aggie outfits! I got this cute shirt that I’m wearing in the pictures below! After shopping, everyone started to arrive at JP’s parents’ house! We decided to tailgate here for the first game. It made the most sense since there aren’t as many people in our tailgating group plus this allowed for quick access to air conditioning and flushing toilets. The A/C is important because Miss Chloe Grace had to tailgate with us! It’s safe to say she had a great time! Tons of people to love and snuggle her. We had a great time too because we had food, drinks, A/C, toilets and family at our finger tips. Tailgating at the Gougler’s was a win-win for all! When it was time for everyone to go to the game, Jody, Chloe and I stayed back to watch from the comfort of the couches! Actually, I dropped my friends off near the stadium since they had a car parked to take back to the Gouglers. This kept them from having to walk miles to get to the stadium! When I got back, I found Jody and Chloe so perfectly content and snuggly. Chloe loves her JoJo so so much! We enjoyed hanging out just us 3 girls during the game. While I missed the excitement of seeing the new stadium, that’s about all I missed. The game was a complete blow out, luckily in our favor. I’m glad I stayed home since our group left at half time anyway! My Aggie Princess was decked out in her Aggie onesie, a maroon bow (not on her in these pics!) and her Aggie blanket that Aunt Julie made her! Sunday I set my alarm for 7:30am because I knew I wanted to get out and run again! The overnight low was in the mid-60s and we haven’t seen anything below 75 in months! I also knew that it wouldn’t last long, so even though I was tired, I went through my morning get ready routine and was out the door by 8:30am and it was 65 degrees with only 50% humidity. Y’all, we live in a constant 80-100% humidity and it’s always upwards of 90% in the mornings, so this was unheard of for September! I got 3.5 miles in which is my current longest distance since starting to run again 2 weeks ago! And it was a very hilly run but I maintained an average pace of 9:30…score! There were about 60 people there, an awesome turnout. So many people brought food to contribute that we ran out of space to put it all! It was a beautiful celebration for a wonderful man. We all miss Walter so much already. I’m glad that we were able to be there to support his family and my daddy. Unfortunately or possibly fortunately, the only pictures I took yesterday were of Chloe. I can’t stop snapping pics of this girl! She was the hit of the party and brought even more joy to a potentially sad event. Sunday we also watched our first full day of FOOTBALL! Unfortunately, the Texans got their butts kicked, but the Packers beat the Bears! Seeing the Packers win always lights up my Sunday. Beating JP in Fantasy Football also lights up my Sunday. I’m beating him in our friends league, but might lose in the family league. I also joined a Houston Blogger league this year and I’m pretty sure I’m going to win…sorry Emily! Yet again, we had a wonderful weekend with friends and family. Weekends with this girl in our life are more full then I could imagine. How did we do life without her?! Did you cheer on your favorite football teams this weekend? 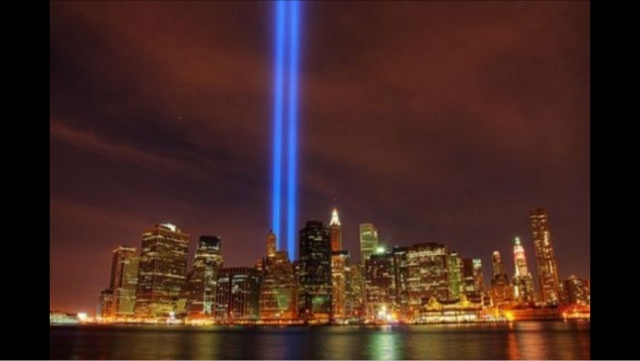 It’s hard to believe that it was 14 years ago that the 9/11 attacks occurred. 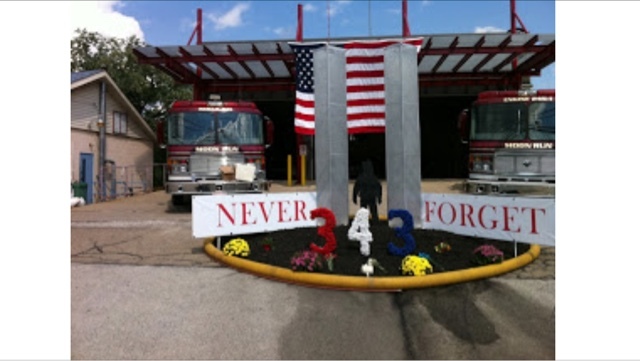 I snapped the picture above four years ago while driving by our local fire department when we lived in Pittsburgh, PA. It was the 10th anniversary of 9/11. Here we are 4 more years later and I still get chills when I think about the events that happened on that day. I was a freshman in high school. I didn’t really know what the World Trade Center towers were by name. Someone had to explain to me those were the twin towers in NYC before I knew what people we talking about. (Give me a break, I was 13!) I was in 2nd period theatre class when the first plane hit. We were shocked, confused and scared. As the day went on, several kids were pulled from school to be with their families. During 4th period World Geography, we were watching the news when the second plane hit the other tower. It was insane and beyond comprehension. Why was this happening? What was going to come next? How many people have to die? It was an overwhelming day for a 13 year old, I couldn’t imagine enduring it as an adult with more understanding of what was truly happening. 14 years and one child later, I feel like I have yet another take on the day’s events. Having a baby changes your perception of EVERYTHING. I’m sure many of you already knew that. This year, I think of all the children that were ken and didn’t get to meet their father or grandparents because of the attacks. How many firefighters had pregnant wives or just had a baby? How many business men went into work to make a living for their families and never made it home? Devastation. That’s all I can think of. As we do every year, remember all the lives we lost on this day 14 years ago. Remember the Heros who risked their lives, and some lost, in order to save the lives of so many. Remember the wives and children and parents who lost their loved ones. Remember those fighting the war on terrorism, fighting so that we can be free. Remember our country. Today lets forget our differences and problems. Let’s stand united as the greatest country. Remember this day, fight for our freedom and stand united. Our country has experienced so much tragedy the past few years. We need to move beyond it all as one. I love three day weekends. Even though I still haven’t gone back to work, I still love three day weekends. Want to know why? More time with Chloe’s daddy! I love having extra time with him home to snuggle with us and do fun stuff. This weekend was definitely fun and kind of busy. It was still a Laborless Labor Day weekend though! 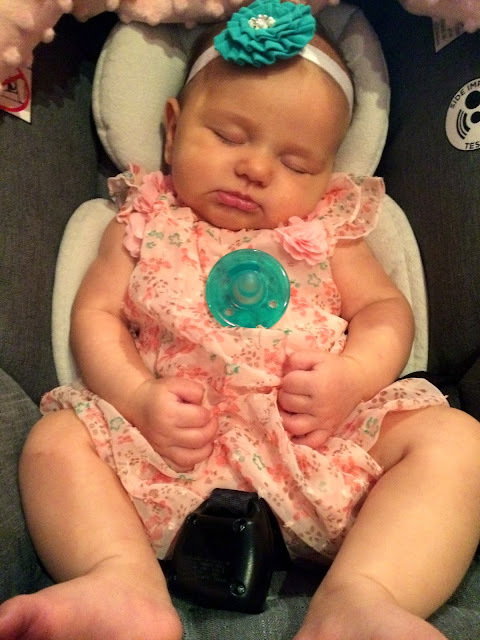 Thursday we packed up, put on one of the cutest outfits and Chloe and I headed to Nonna’s house! We spent the night there so JP could get a good night’s sleep. I ended up getting a great sleep because little miss decided to sleep from 10pm-3am. It was awesome and I was a proud momma. But let’s rewind to before bedtime. We didn’t do much besides relax, hang out and of course, bathe Chlo. My mom absolutely loves giving Chloe baths and I just love watching them! Friday was a really fun day because everyone was at my parent’s by mid-afternoon! My dad was in town, Emily came home and JP was off work. We were just missing Benny Boy! Emily, Mom and I had a dress up session and photo shoot with Chloe. First we had to try on her pretty Cinderella tutu and then we had to get pictures for Matt’s football game. It was Senior Night on Friday and it was Chloe’s very first football game. She was such a good girl and loved cheering on her Uncle Matt! top row: Awesome shots of Chloe in her tutu. She wasn’t ready to cooperate with us! 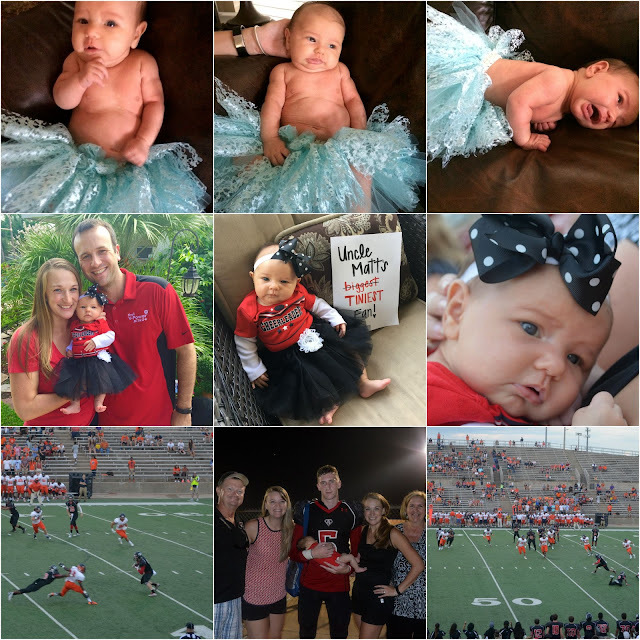 middle row: Our little cheerleader in training! bottom row: Matt’s game. He even caught a touchdown for Chloe! 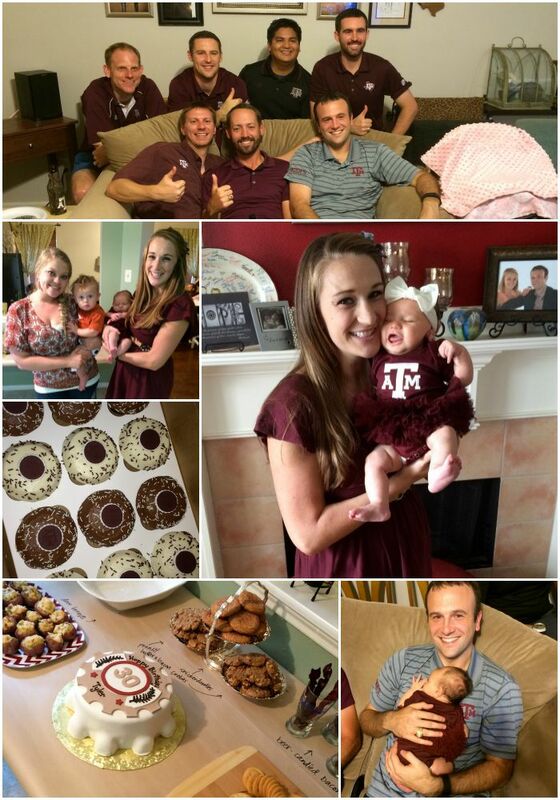 Saturday was the first Aggie game of the season and Tyler’s 30th birthday! We spent the morning having brunch with JP’s parents and their friends out in Katy before heading to Copperfield for game day festivities. The Ags played in Houston at Reliant Stadium again ASU and they decided to win as a birthday gift to Tyler! 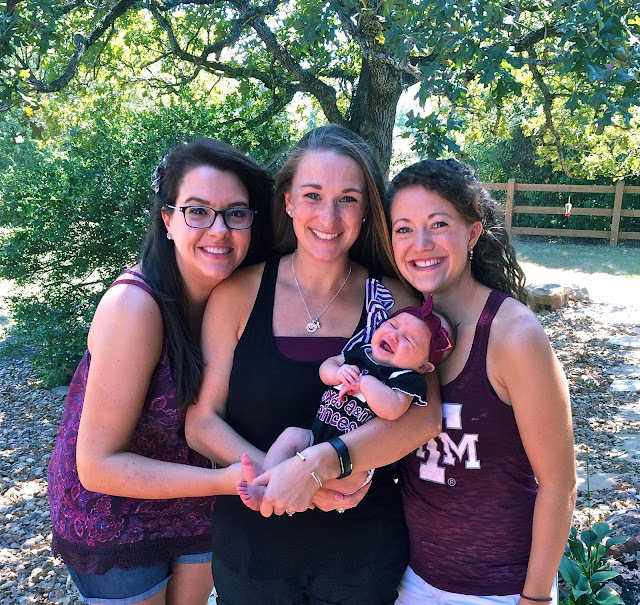 We had a blast tailgating and watching the game with so many of our closest friends, many of which were able to meet Chloe for the very first time. Again, she was such a good baby and loved getting to snuggle with her Aunts and Uncles. bottom: Amazing appetizer and dessert spread by Ashley; my two favorite people in the whole world. Sunday and Monday were lazy days. Sunday Chloe, JP and I had a jams all day party! We stayed in our pajamas, cooked pancakes, snuggled, made funny faces and cleaned the house. We even ordered pizza in and just hung out together as our little family! Monday we continued our lazy trend and had a relaxing morning before heading down to Sugar Land. My Aunt Dianne has been living with my parents since February and will be going back to Florida tomorrow 🙁 I wanted to make sure she had a day to just snuggle Chloe and love on her before she had to go home. We’re going to miss her so much! Luckily, I know she’ll be back next year and we’re already looking forward to it! 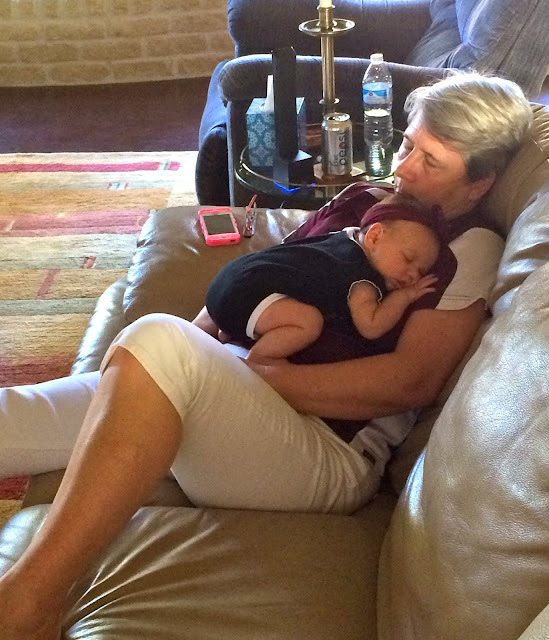 While Aunt Dianne and Chloe snuggled, JP and I had some time to just hang out. Naturally, we played in the pool! It was my first time to go swimming since before Chloe and I was able to have fun, play our silly games and swim around. It was kind of our own little day date! Life with Chloe continues to get better each day! She’s so much more alert and aware of what’s going on around her. It’s a joy to watch her develop her personality. Becoming a mom has been the biggest blessing and I love sharing our fun times with y’all! As a fitness enthusiast and professional, I’ve tried and tested my fair share or gadgets and apps to help me become more fit and active. Some I love, some I like and some I don’t even know who would really use them. Instead of bashing some of the less used and liked gadgets and phone apps, I thought I’d brag about my favorite products for activity tracking to boost fitness levels. I’ve been using my Polar Loop for two years now and I’m obsessed! I started using the FitBit back in 2011 when it was just a little machine that clipped onto my shorts or bra. 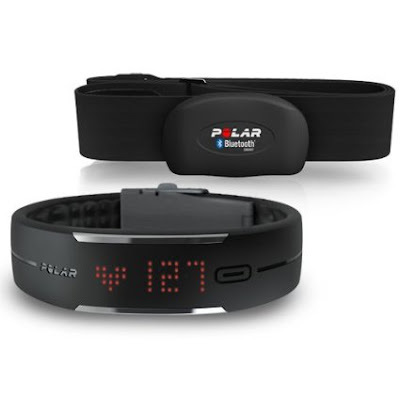 In December 2013, I decided to try the Polar Loop because I liked my Polar FT4 heart rate monitor watch and the Polar Loop would sync to my heart rate monitor chest strap. It’s been a great product! I counts my steps and gives me an accurate calorie count based on my height, weight and daily activity. It also tracks my activity level based on laying, sitting, standing and running. Using the heart rate monitor chest strap, it can track your heart rate, analyze your training and put your training into your daily activity. I personally love it because it helps me to get up and moving on less active days and it really motivates me to push harder during my workouts. The Polar Loop also syncs to your computer and mobile phone with the Polar Flow app. You can see your activity at each part of the day and even how well you’re sleeping! 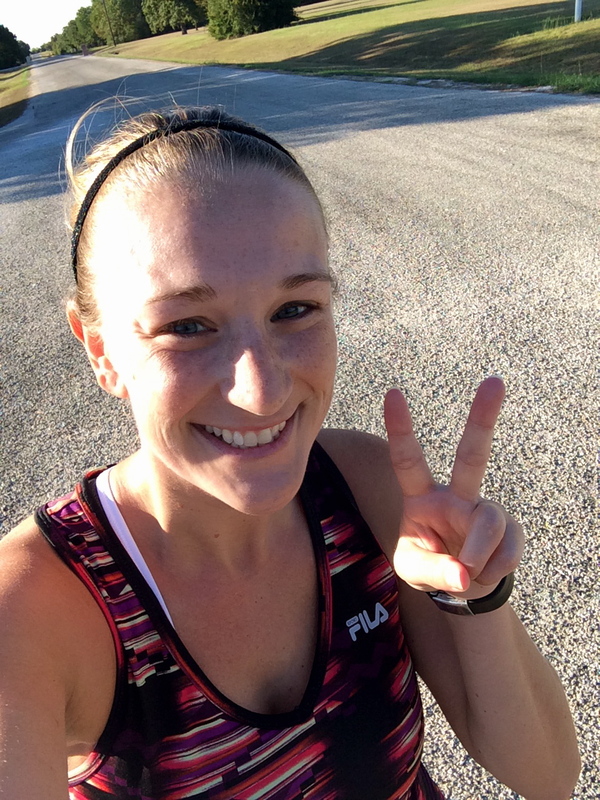 Check out my Garmin Watch and Polar Loop (and my favorite Mizunos) from a training run last fall! JP got my Garmin for me as a Valentine’s gift back in 2011. I still run with the same exact watch to this day. That’s over 4 years old with just one issue; my charger died so I had to get a new cable. That’s it! This version of the watch is no longer produced by the manufacturer, but I’m sure the newer Garmin Forerunner models are equally as effective and efficient. I love that with my watch I can see how long I’ve been running, how far and what pace I’m running at. This is incredibly helpful when training for races and you need to make sure you’re running faster on your tempo days and slower on your long run days! You can also change the different stats that you see on the face of your watch. It also accurately tracks your calories based on height, weight, heart race and pace at which you’re walking or running. The watch holds months worth of data from past activities, so you can go back and see if you’re improving. It also syncs up to your computer for easy data storage. I started using Spotify when I began a full time career as a trainer and fitness instructor. I originally used my iTunes, but since I was constantly creating new play lists and trying to keep up with the latest and greatest music, I was spending more money than I wanted to a month on music. I decided to bite the bullet and sign up for Spotify for $10/month. It has been a lifesaver! I can create playlists for all of my classes and leave them on my phone in offline mode without taking up tons of memory space. As long as I’m connected to Wifi, I can access those playlists. If I know I won’t have access to the internet, I can download them to my phone for however long I want. This is particularly great for when I’m running or walking outside and want to jam a little! 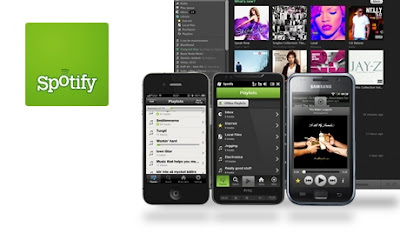 You can also listen to radio stations, similar to Pandora, without any commercials with the paid subscription. I’ve been using Spotify for about 2 years now and love it! Sometimes I don’t feeling like wearing my Garmin watch. 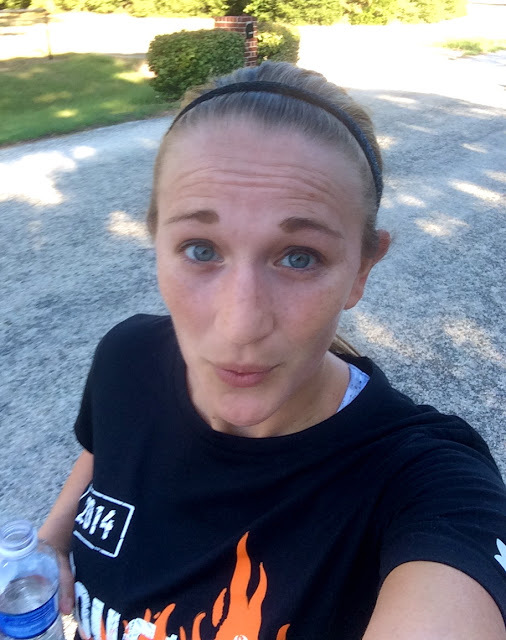 I may not necessarily care about my pace, but I still want to know my distance. 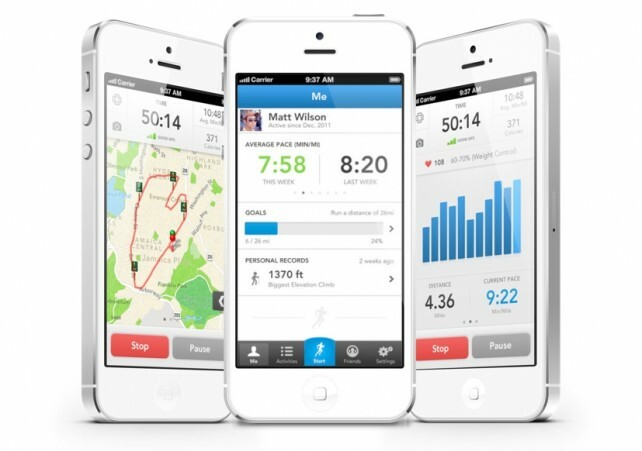 In these instances I use the RunKeeper app on my iPhone! It links up to GPS and tracks your distance, pace and calories. It doesn’t only track running workouts, but walking, cycling, swimming, hiking, etc. Once you’ve completed your workout, it stores in on the app and notifies you if you’ve hit new records like fastest time, farthest distance, most workouts recorded in a month and so on. You can also connect with friends who use the app and check out each other’s progress. If you aren’t ready to commit to spending a couple hundred dollars for a GPS watch, this app has everything you need…and it’s free! There is now an upgraded pay version that also includes training plans and more if you’re interested. One more thing, it now connects to My Fitness Pal and automatically adds your workouts to MFP for you! 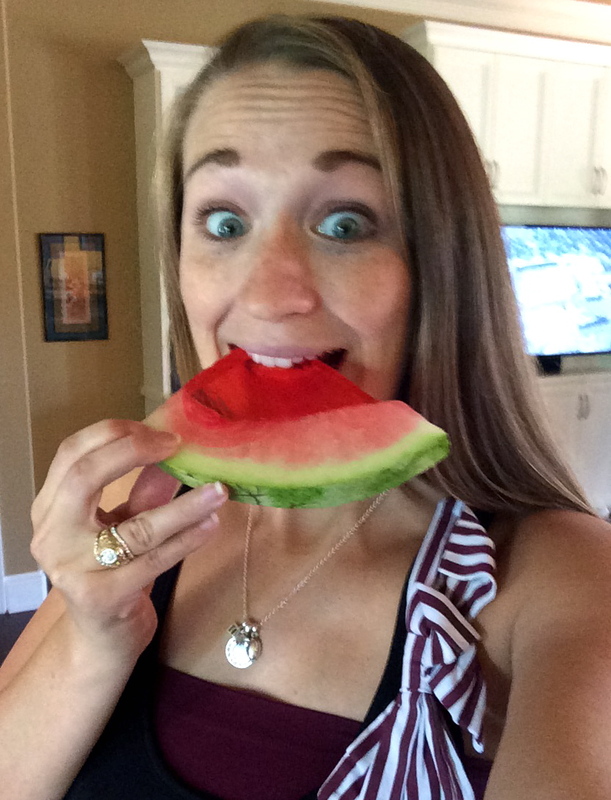 Just one less thing you have to add to your nutrition tracker each day! This is Polar’s new activity tracker. It’s more like a watch then the Polar Loop, but it has very similar functionality including tracking steps, calories, distance and activity level, but now it will give you a slight vibration if you’ve been sitting for too long! It also connects to your Polar heart rate monitor and the Polar Flow app. The A300 seems to have a better interface. You can always see the time as well as some of your activity stats without having to constantly press the button to slide through your info. It seems to be a neat product and a great one up on the Polar Loop. It’s something I want to check out a little more! Most of the specs for the M400 seem similar to the A300, but with even more functionality. 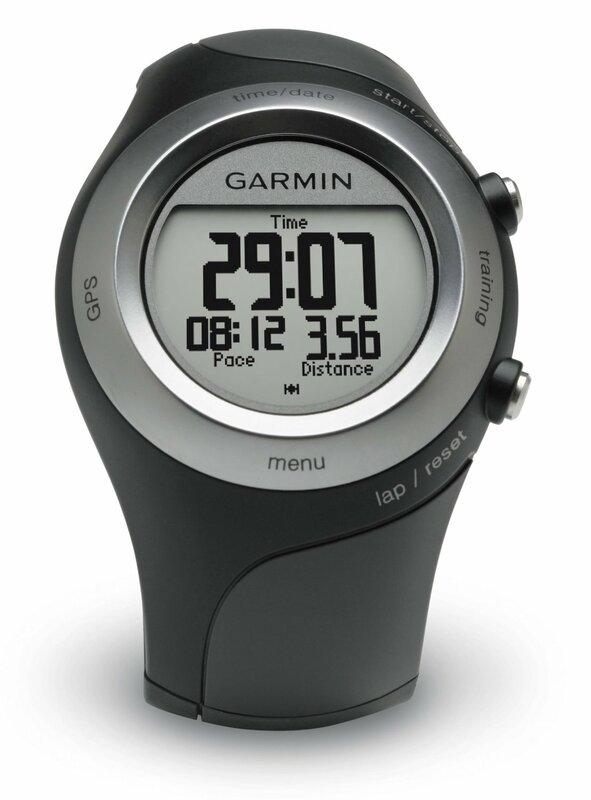 The M400 is also a GPS watch for multi-sport use! This would be a great upgrade for me from my Polar Loop and Garmin. One watch for both uses! 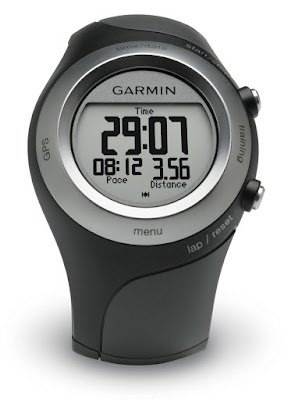 It also has a sleeker design then my current Garmin watch and would probably fit my tiny wrist much better! Because it’s an Apple product and I’m sure it’s awesome, but let’s be honest, I’m going to wait until the next version comes out. It seems that it’s usually best to wait for version 2 of Apple products. While I’m not necessary interested in getting a Fitbit product, I know plenty of people that use them and love them, my husband and clients included! Fitbit products are great and would be a good alternative brand of activity tracker for those of you that are interested. There are several different options to choose from based on how much you want to track and how much money you’re willing to spend! We definitely live in the age of technology and we all want the latest and greatest! I hope that this helps anyone looking for some new fitness activity gear! Happy hump day…now get out there and get moving!